While she is a highly accomplished professional in her own right, today producing Sherlock, one of TV’s hottest properties, the shadow of her mother and husband loom large over Sue Vertue. Vertue has earned well-deserved praise for her role as a producer on iconic programs like Mr Bean and The Vicar of Dibley. It was once she had established herself professionally that she was willing to embrace her mother’s production company. Vertue’s mother is Beryl Vertue, a trailblazing TV legend in the UK who established a career first as an agent to comedy writing legends like Spike Milligan, along with comedian Frankie Howerd. She later moved on to sell high-profile UK TV formats like Steptoe and Son and Til Death Do Us Part to the US before producing the rock opera Tommy by The Who. Forming her own production company, Hartswood Films, Beryl Vertue went on to produce iconic UK comedies Men Behaving Badly and Coupling. Vertue married a TV talent herself, writer-producer Steven Moffatt, then known for cult series Press Gang and Joking Apart. Basing it on his relationship with Vertue, Moffatt went on to create Coupling. Nowadays he is the showrunner of Sherlock and Doctor Who. Sue Vertue is being modest when on her Twitter profile she says that she has a “nice life”. “I joined Hartswood quite a time after Mum had formed it. I thought I can’t go to Hartswood until I’d done something of my own. I’d always be Beryl’s daughter and I’d always be the second person on the phone if you couldn’t get hold of her. Once I’d done a series called Gimme Gimme Gimme… obviously I’d done Mr Bean and Vicar of Dibley, but Gimme was the first one I knew wouldn’t have happened if it hadn’t been for me. Once I’d done that, then I felt I could go and join the family,” Vertue explained. “She [Beryl] asked me and said ‘when you’re ready, I’d love you to join’. Bless her, she didn’t push it. “Even, weirdly at work, we call her Beryl, I don’t call her mum,” Vertue revealed with a laugh. While Beryl Vertue may have pioneered UK format sales to the US, Sue Vertue has the distinction of being involved with one of the most-high profile failed US adaptations of a UK series with her series Coupling. “I think they thought they were buying the next version of Friends,” Vertue said. “They had huge posters which basically said ‘Meet Your New Best Friends’ and we were going ‘don’t mention Friends, don’t mention Friends’. You have to make the show that you want to make. Friends co-creator David Crane and his partner Jeffrey Klarik later went on to create the Matt LeBlanc comedy Episodes, a series about a team of husband/wife UK producers who go to the US to adapt a TV show of their own for the US. Many have drawn the comparison between the characters on that show and the husband/wife team of Sue Vertue and Steven Moffatt. 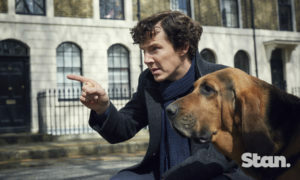 Vertue insists that she has never seen Elementary, a contemporary US Sherlock Holmes series that launched soon after the success of her own contemporary Sherlock Holmes series. 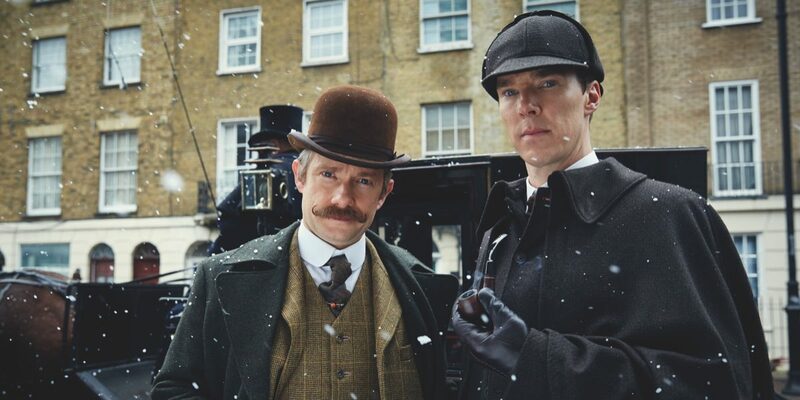 Sherlock, the series that she produces alongside her husband, Steven Moffatt, quickly became a very big success. Vertue says that they didn’t expect the show to achieve the success that it has. 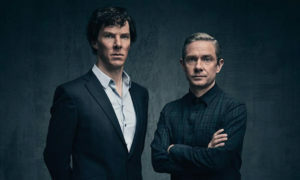 With series stars Benedict Cumberbatch and Martin Freeman now both global household names, Vertue does note one major change on set: “They’ve got bigger trailers,” she said wryly. 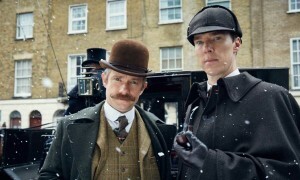 Sherlock can be seen in Australia on Stan.